Horror, science-fiction, art-house – in 1987 the Fantasy Filmfest was launched in Hamburg.For 30 years, it has bin going on tour regularly with venues in seven German cities. In the meantime, what used to be just a gathering of enthusiasts has become a much-respected event. A car breaks down in the desert, a zombie appears, the first victim lies dead – Colin Minihan’s It Stains the Sand Red gets to the point quickly. What follows, turns out to be a successful blend of bloodcurdling horror and splatter comedy – throughout the whole film, Molly, the scantily dressed stripper, is pursued by a wheezing undead through the desert. When she dumps her luggage on the annoying admirer to give herself a chance to catch her breath, the audience applauds laughingly. It is clear that the audience has already seen much tougher things. The “Nights” Fantasy Filmfest, at which the American zombie chiller is being shown along with nine other films, is only the beginning of the actual festival in September and October. About 60 films full of blood and nail-biting suspense will be shown at the Fantasy Filmfest in seven German cities over the course of several weeks. With well over 100,000 festivalgoers it is one of the most successful German film festivals and one of the most important international genre festivals. 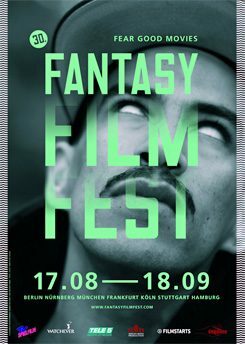 Photo (detail): © Fantasy Filmfest The very first festival in Hamburg in 1987 was very much geared to the retrospective approach and showcased such horror, science fiction and art-house classics as Stanley Kubrick's A Clockwork Orange (1971), Luis Buñuel's L'age d'Or (1930), and F.W. Murnau’s Nosferatu (1922). The tradition of the “Fantasy Film” and sophisticated cinematic art were on the same bill as the well-known shockers directed by John Carpenter or Wes Craven. Especially in Germany, horror cinema was indexed particularly strictly or prone to being cut and that made the urge to fill the festival screen with blood even greater, also with the films of the moment. A star director like Peter Jackson, who was still unknown then, came personally to Hamburg to present his feature film debut, Bad Taste, (1987). In the broad spectrum of the German festival scene, the Fantasy Filmfest now plays a special role. Not only because of its success, but also because it has been held on a staggered basis in several German cities since 1989. The intention was to create a unified community out of the various scattered fan groups and thus promote ticket sales. This was because it is not funded by state subsidies, only by the money from entrance fees and sponsors. This is the reason why cities with low visitor interest are rejected as unsuitable. There is no other German festival that reflects the market as well as the Fantasy Filmfest. In recent years, horror and trash, often with drastic violence, clearly took precedence. The big fan base, which can get no satisfaction from mainstream cinema, just has to see the latest gems of the genre at least once on the big silver screen – in the original version, with or without subtitles and at best in the presence of the filmmakers themselves. A lot of the films do not have a distributor and will never make it to normal cinemas, some, however, might make it to the realm of DVD, Blu-Ray or Video on Demand. Nevertheless, the festival remains an important launching pad for a possible commercial exploitation. Jonathan Glazer's science fiction thriller Under the Skin (2013) starring Scarlett Johansson as a murderous alien and Yorgos Lanthimos' dystopia The Lobster (2015) were first shown, of course, at the Fantasy Film Festival. Then, after huge protests from the fans, they made it to the cinemas in the form of a limited distribution. And in 2009, Neill Blomkamp's gloomy sci-fi drama District 9, which was nominated for several Oscars, won the only film prize of the festival, the Fresh Blood Award – an audience prize for the best debut. The list of successful films is long. Modern Sci-Fi classics are to be found on it, along with such things as The Babadook (Jennifer Kent) and It Follows (David Robert Mitchell), who in 2014 heralded in a renaissance of sophisticated horror cinema. In 2016 Dan Kwan and Daniel Scheinert landed a very special coup with their eccentric comedy Swiss Army Man, starring Daniel Radcliffe as a very lively corpse – it had audiences on the edge of their seats. The idea is for the films to “challenge and overchallenge, to break with conventions”, as the organisers wrote in the program booklet. The question is, however, can the festival still live up to this claim today? On the one hand, the tastes of audiences are changing more and more quickly. Who would have thought years ago that a series like The Walking Dead would one day move the zombie theme into the mainstream? On the other hand, competition from streaming services is leading to all kinds of new problems. “Netflix and Amazon are hardly interested in festivals, at the most maybe for Cannes and Venice,” says the new festival director, Frederike Dellert. The festival’s traditional task of delivering low-reach films to their target audience is now also being fulfilled by the Internet. Nevertheless, festivals are becoming increasingly popular – the audiences appreciate the big screen. For the German genre film, traditionally neglected for so long, the Genrenale and achtung berlin have become important platforms. Ms Dellert has detected a new trend at the Fantasy Film Festival, which mainly shows international productions – what used to be a “man's event” is now being increasingly infiltrated by women as well. The female confrontation with horror, which has long been an issue in academic studies, is now also reflected by the number of female festivalgoers. At the “Nights” Filmfest the men are clearly in the majority. Women, however, are becoming more and more noticeable. Not only in the festival hall, but also on the screen, where they are no longer being limited to playing the traditional role of the “final girl”, the attractive victim that has a chance of survival. In It Stains the Sand Red, the grandiose Brittany Allen takes on the zombies all on her own and in a most self-assured manner. A.D. Calvo’s haunted house thriller Sweet, Sweet Lonely Girl – so stylishly inspired by the 1970s – relies entirely on a female cast. The alleged fear of women when faced with zombies, slashers and gallons of artificial blood is now little more than an amusing cliché of yesteryear.